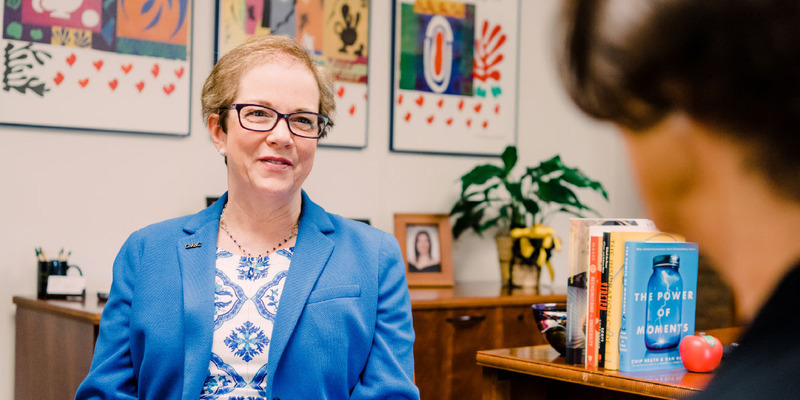 While it is important for the chief business officer to have a seat at the table to move the agenda forward, it is equally important to build a pipeline into the CBO role, says Lynne Schaefer, NACUBO board chair for 2018–19. Having gained support early in her career, Schaefer is steadfast in providing mentorship and professional development opportunities to individuals who aspire to be CBOs. Dedicated to not only staff development, she is also committed to creating collaborative environments that will advance the institutional mission and enhance student success. In the year ahead, Schaefer plans to continue succession planning efforts, introduce to the membership NACUBO President and CEO Susan Whealler Johnston, and focus on the association’s strategic initiatives. This simple yet powerful message has served Schaefer well throughout her career, including her current role at the University of Maryland Baltimore County, a public research university, where she is vice president of administration and finance, managing a leadership team of 30 and a division with more than 250 people. While she now only rarely competes in bridge tournaments, Schaefer is still solving problems and developing successful partnerships through her work as CBO, where she manages a $450-million budget, reporting and control, finance, HR, auxiliary services, facilities, and more. One of the issues that Schaefer is currently working on is to build a pipeline to the CBO role, especially for underrepresented groups. As someone who landed a job in higher education due to the efforts of someone in a leadership position, Schaefer continually works to pay it forward by motivating, mentoring, and providing the same opportunities to those who show potential and aspire to be leaders. She notes that faculty and staff account for 70 percent of most budgets in higher education, and as such, this needs to be the focus of all CBOs—supporting and encouraging talent in the best way possible. Transitioning to higher education after starting her career in the Michigan state government, Schaefer advises aspiring CBOs to be engaged and get involved in special projects and universitywide committees. “Let people know that you are excited about the work and are committed to the institution,” she says. Schaefer also encourages those interested in advancing their careers to be good resources and bring ideas to the table, and perhaps most importantly, let people know that they aspire to take on additional responsibilities and ask them for opportunities to work on new projects. 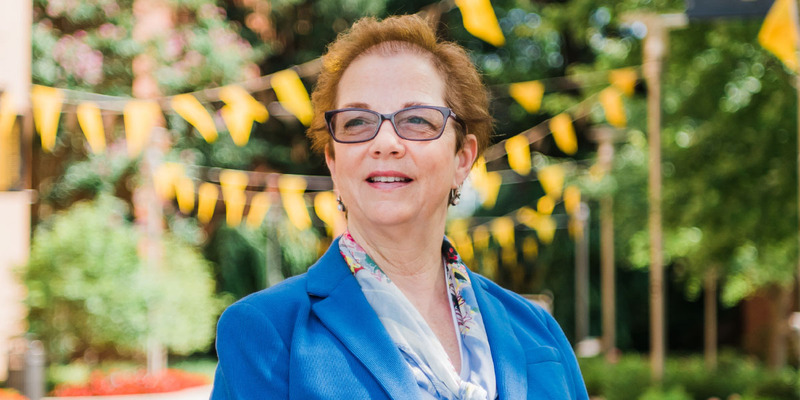 In this interview with Business Officer magazine, Schaefer talks about the importance of succession planning, her passion for higher education, the successes at her division in UMBC, and her goals as board chair for 2018–19. You started your career in state government, working for the governor’s office in Michigan. Why and how did you transition into higher education? I remember very distinctly, at 12 years old, being inspired in my civics class by the idea of being a public servant. I knew that’s what I wanted to do, but at the time I didn’t know exactly how that would work. After I graduated from Michigan State University in East Lansing, I went to work in the state government, starting with the state budget office. I then moved to the governor’s office as a policy analyst, where I focused on jobs and economic development. As luck would have it, I was assigned to higher education policy and my role expanded to work more broadly on those issues. Later, I became a gubernatorial appointee, serving as president of the Michigan Education Trust—a guaranteed tuition program. While I was at the Michigan Education Trust, serving on its board at the time was the president of Wayne State University, David Adamany, someone I admired tremendously. He eventually recruited me to be budget director at the university and it happened to be the right opportunity at the right time. Once I got to the campus, I found it to be wonderful and the best place to work. I built my career at Wayne State and discovered an aspiration to become a chief business officer. I never looked back. What was wonderful about your experience there? In state government, we were committed to developing good policy and to allocating resources for priorities. But, we rarely saw the impact of our work. Being on a college campus, you see in the students every day why you are there. Watching them succeed and helping them on their way is inspiring. I had the opportunity to see new buildings go up on campus, the grounds that we made look beautiful, and the financial statements grow stronger through our efforts. There was so much more direct feedback on a daily basis. How would you characterize your relationship with the president of Wayne State University, who recruited you? What drew you toward that job? David Adamany recruited me as budget director and it was an unusual role in that I reported directly to him. He was brilliant and had extraordinarily high standards, and he had a lot of courage to say what he thought was right about important social issues of the time. He stretched me in so many ways, giving me the confidence to reach further than I otherwise might have, even if it sometimes was uncomfortable. I also loved that Wayne State is a major public research university on an urban campus, with a very diverse community of students, faculty, and staff. Talk about your transition from budget director at Wayne State to CBO. After serving as budget director at Wayne State for a few years, I shared with President Adamany that I had done the work that I was recruited to do and was ready to do more. I told him that I aspired to be a chief business officer. I let him know that I wanted to stay at Wayne State, but given no obvious opportunity, I asked him to help me find the right fit. Taking advantage of a retirement, he went on to create a new position for me—vice president for administration. He split the administration and finance functions, giving to me all the administrative duties so that I could get the experience in HR, facilities, police, and auxiliaries. He also appointed me to the strategic planning commission. He gave me so many opportunities that allowed me to elevate my thinking and my skill set. This allowed me to position myself as a good candidate for the CBO role. My first position as vice president for finance and administration was at Oakland University in Rochester, Mich. From there, in 2005, I came to the University of Maryland Baltimore County (UMBC). It was such a gift to find and be appointed to this position. I didn’t realize, when I accepted the position, that the warm, welcoming, and supportive community that I saw during the interview process was deeply embedded and genuine across the entire campus. I also didn’t fully appreciate at the time the joy and inspiration I would experience working for President Freeman Hrabowski. What has it been like working for President Hrabowski for the past 13 years? He is the most inspiring and authentic leader that I have ever known. He has the truest compass for integrity, purpose, and the higher ground, never wavering in his beliefs. As a colleague—as someone for whom I work for on a daily basis—he’s such an authentic, compassionate, and respectful individual, with a great sense of humor. President Hrabowski has been very supportive of all the things that I wanted to do. For instance, he has supported a transparent and strategic budgeting process, a shared services initiative, emergency preparedness training, and climate action efforts. He has also been encouraging when things haven’t gone as I expected. He became a friend throughout this period. What excites you most about your current job at UMBC? The chance to continue to improve what we do and how we do it. We’ve built a fabulous team over the years and we’ve been able to accomplish so much for the university. We have transformed the financial and administrative aspects of UMBC into a well-run machine. Our divisionwide motto is, “Success is never final,” because we know that we can be even better. I’m also very excited about our remarkable students who I know are going to change the world for the better. And, I get to be a part of helping them on that journey. You were in a unique experience, having your son go to UMBC. How did you navigate through that? How did being a parent of one of those students that you see as changemaker alter your thoughts about the student body at UMBC? We have a very diverse community at UMBC, and our campus reflects the way we want America to be—different races, genders, sexual orientation, and faiths working together. We try to make it more about the things that we have in common. As for my son, who is also different as a wheelchair user with significant physical challenges, he was completely accepted and embraced. He made wonderful friends with people from many different backgrounds. That made this unique community real to me. In a time when we are moving toward more diversity and inclusion, what resources and progams at UMBC promote this effort? In recent years, we have stepped up our efforts in this area for faculty and staff. We’re a community where shared governance is very authentic. We do our best to give everyone a voice, allowing people with different perspectives to engage in and be part of the decisions that we make. We recognize that there’s always room for improvement. We’ve recently held formal universitywide programs that focus on unconscious bias, talking across differences, and conflict resolution. We’ve held discussion forums with faculty, students, and staff. We address these issues at every opportunity, while also highlighting the value of differences and how that fits into the UMBC culture. We also have a diversity council, focusing mostly on faculty hiring and retention, recognizing that faculty need to reflect the diversity of our student body and of America. 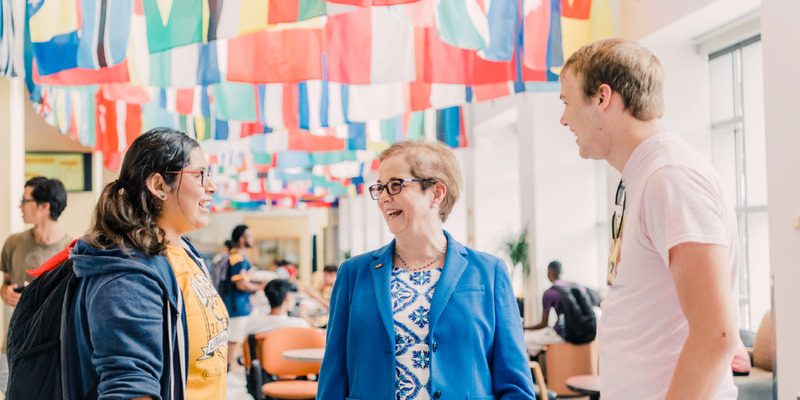 As a CBO, reporting to a president who is very well-known as a leader in espousing diversity and inclusion, how do you fit into those conversations at UMBC? I’m very fortunate to be a chief business officer with a seat at the table, so that I can ask questions or contribute resources, such as providing financial support for programs or working with our human resources department to effect change. Our open dialogue allows us to figure out what steps we need to take to be better. I know that I’m part of this team. What advice do you have for those who struggle to be at the table and for those who don’t feel heard in their roles on campus? You need to find a way to be relevant. Figure out what the campus needs, what your leaders need, what your colleagues need, and what your team needs. Then try to find ways to be helpful in that regard. It was wonderful to start my career in the state budget office. I was a 20-something, with that confidence of youth, who had to learn how to talk to other departments, state department directors, legislators and state officials, and other colleagues in a way that made them feel comfortable and not threatened by my role. Thinking about how you can help is one way to make yourself relevant. What I’ve also learned is that being relevant involves courage and a willingness to say, in a nonthreatening and nonjudgmental way, the things that people either are not thinking about or aren’t saying. Help people to think not just from their own disciplinary standpoint. And I don’t mean academic discipline, but whatever their particular role is. Prior to my arrival at UMBC, there was a concern about the budget process not being transparent and not meeting the needs of the campus community, so I was recruited to address this issue. I came up with a proposed budget process. Part of that was getting all the leaders into the room to decide, collectively, what our budget priorities were going to be for the coming year. This had not happened in the past, so it was surprising to everyone that they could come to agreement on the top priorities that were to be funded. I have a sense that prior to this, most saw resource allocation as a mystery. Now, people see what the top priorities are and how they are being funded. I think that was a good launch for thinking differently about financial resources at the university. Your division at UMBC has established a three-point vision, which includes embracing the role as an expert resource, surpassing customer expectations, and leveraging technology for service delivery. Talk about this vision and the reasons you created one for your division. About a year after I arrived at UMBC, I knew that I wanted to find a way for us to work more closely across this very diverse set of functions. Our jobs vary significantly—financial managers, groundskeepers, police, parking attendants, and more. When you look at it on the surface, they don’t have anything in common with each other. And, yet, there is a common thread—we’re all here to support the core mission of the university. So, this was a new way of looking at things for our division. It didn’t seem reasonable to ask the group to develop a strategic plan separate from the university’s, so we set our sights on supporting the mission and thinking about things that bind us together. A common thread that I’ve seen across higher education administration and finance is that we don’t always feel respected for the contributions that we make to the institution. The idea of embracing our role as an expert resource comes from the idea that the larger university community needs us to be really good at what we do, which will then enable the institution to be better. To that extent, we can appreciate and always bring our expertise to the table. When I was offering ideas for our three-point vision, I suggested “meeting customer needs.” To my surprise, my team said, “Well, that’s not enough.” That told me so much about this team’s aspirations, so we changed the vision to surpassing customer expectations. Lastly, we had to acknowledge that as the institution grew, we were not going to get more resources in administration and finance. How could we continue to improve and offer better services without getting any additional resources? This was at a time when technology was rapidly evolving, so we asked ourselves how we could use technology to solve routine operations, allowing us more time to focus on the complex issues. We focused specifically on using evolving technology for the services that we provide. What does that mean? We put all forms and user guidelines online, we implemented new systems, such as e-billing, work control, and more. Now we have apps, but back then we put simple service functions on the website for students, faculty, and staff to take care of routine business. How do you get staff to continually keep up with and focus on the divisional vision plan? As a way to reinforce the three elements, we focus on them during our divisionwide leadership retreats, which I hold at least once a year. We give awards to employees who exemplify the vision elements. I recognize during our annual picnic staff who are fulfilling these expectations. We have more than 250 people in administration and finance who own these vision elements and are very proud of the things that they have achieved. During the holidays, I also host a breakfast for all our employees, where I share highlights of what every department has accomplished over the course of the year. I want them to see that, as a group, we have a tremendous impact on UMBC and its success. How has creating this vision changed the culture or other aspects of the work that you do or the work that your colleagues do? Our three vision elements and mission statement are in support of the core mission of the university. Every year, we translate that into a set of strategic initiatives that are distinct to our specific areas, such as HR, facilities, finance, police, and so on. My senior leadership team tracks progress over the course of the year, and every quarter, each department gives a report on achieving its quarter goals and identifies its goals for the next quarter. At last count, we have completed more than 200 large strategic initiatives over a 10-year period. Seeing the accumulation of what we have accomplished gives us great pride and it has resulted in the transformation of how we support the university. It sounds like you transformed the division. Slowly but surely you found opportunities for change. What drives that? I am cursed (or blessed) with a driving need to fix problems. I also find it’s very exciting to see improvements unfold; to see something better happening. It’s nice to solve problems that have been irritating people for years and to see a well-oiled machine take the place of something that was previously clunky. I have honed this skill set and passion through experience. At each institution that I’ve worked for, I’ve learned that by bringing everyone together, building a strong team, and agreeing on our direction, we can make a transformational impact. Tell me more about what you’re passionate about. I am on a personal lifelong journey to become a better human being and to help create a better world. That might sound trite and clichéd, but this is what drives me. Part of that involves supporting those around me—friends, family, and colleagues—to be the best that they can be. I work very hard at exploring how to be a better person. I do that through reading, listening, or using a coach. I have taken advantage of professional development opportunities, including through NACUBO and EACUBO. I’ve shared this passion for personal development with the 30 people on my leadership team in administration and finance. Every year, we go away for at least a one-day retreat, where we work on strategy and facilitated personal leadership development. What are you hoping to bring to the NACUBO leadership and to the organization? I’m fortunate to be coming into the chair position at a very interesting and important time. We’ve welcomed our new President and CEO Susan Whealler Johnston and I view it as my responsibility to support her during this transition, as well as help connect her with our business officers across the country. I will support her efforts to continue to build the NACUBO organization. There’s also the strategic blueprint that the board has approved and the NACUBO staff has been doing a great job of moving forward. I will be working with the board to hone in on one or two strategic items that we specifically want to focus on in the coming year. I know that the board and staff have great ideas for our future, and with Susan’s leadership and guidance, we will decide on our areas of focus for the next year. One of my goals is to continue to build the pipeline into the chief business officer role, especially for underrepresented groups. This is a truly rewarding profession and I don’t think that we have an adequate pipeline for filling these roles in the future. We need to make sure there are good people to come along behind us. What other things do you want to share about your commitment to building diversity and filling the pipeline through succession planning? What would you encourage NACUBO and your colleagues to do? This has to be intentional. As senior leaders, many of whom are looking at retirement as their next step, it’s up to us to look to those who work for us and others in higher education, who have potential, and help them to build their skills. Give them opportunities, take risks, and take a chance on them. Teach them how to be good leaders. How do you do that? You do that by trusting, by delegating, and by coaching. I love that NACUBO developed NACUBO Fellows, a one-year leadership development program for aspiring CBOs. I’ve met some of the participants and they are remarkable. I can see them as our next chief business officers. Being able to play a role in that, for all of us, should be compelling and very satisfying. I’ve talked a lot about knowing what people need at different stages of their careers. I would like for us to delve into that more deeply and to figure out what program or suite of programs, over the course of someone’s career, would be helpful in preparing them for that role, if they desire to pursue it. Thinking about my own path, early in my career so many people gave me opportunities that gave me the confidence to believe that I could be a leader and they put me on a trajectory so that I could work towards that. I want to be somebody who does that for someone else. MARTA DRAKE is senior vice president, education, development, and membership, NACUBO. Family: Widowed with a daughter and a son, who are 24 and 23 years old. Reading you’d recommend: The Mind of the Leader: How to Lead Yourself, Your People, and Your Organization for Extraordinary Results (Harvard Business Review Press, 2018) by Rasmus Hougaard and Jacqueline Carter. Recent travels: Alaska and France. TABASSUM MAJID, executive director, Integrace Institute at Copper Ridge, Sykesville, Md. The University of Maryland Baltimore County (UMBC) is a public research university that is dedicated to diversity, social responsibility, and lifelong learning. UMBC is also an honors university with academically talented students; in 2017, incoming freshmen had an average 3.71 grade point average. The institution offers bachelor’s, master’s, doctorate, and certificate programs. Listen to Lynne Schaefer’s CBO Speaks podcast, where she shares insights on communication, leadership, and finance.